Team Baghdad member Kristoffer Spone made a guest appearance in the Xp-44 “Too bonita” during the Norwegian ORCi Championships. Finishing in a 3rd place only 1 point after this year’s World Champion Claus Landmark. 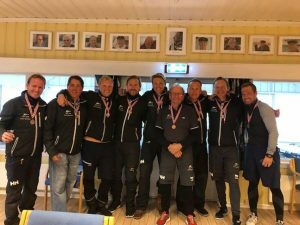 Torkjel Valland and his crew from Bergens Silforening referred world champion Claus Landmark and his men to silver place in ORCi-NM in Tønsberg. The Landmark 43 “White Shadow” already got a good grip in the championship and started with two first places under challenging conditions with a lot of shifts and big differences in pressure on the pitch. Many “hot” boats and names were represented in the 18-yard big field, including Norway’s newest regatta machine, the Swan 50 Club-a “Proxyflyer” with Jan Muren (Asker) as a skipper. However, it was not the championship of the newest and most extreme boats. Three teams eventually separated. In addition to the sailors in the “White Shadow”, “Santa” with Claus Landmark (Soon) as a skipper – nothing less than this year’s superb world champion in the class – and the Xp-44 “Too Bonita” with Knut K. Heje (KNS) as skipper and with capabilities like Kristoffer Spone and Olympic sailor Kristian Ruth in staff on board. With 5th and 4th place as followers of the two victories, “White Shadow” led after the first day in front of “Too Bonita” and “Santa”. The first two had the same score, while “Santa” was two points behind. In other words, it was even and open. After some waiting due to big windswift, the organizer, Tønsberg Seilforening, had completed the planned two sailing sessions on Sunday. And this day the big and fast boats came to their right. Per Ottar Skaaret won the first sail with the field’s largest boat, the TP 52-a “Wolfpack” – five seconds ahead of “Proxflyer” at the correct time. Claus Landmark was the dive starter and Torkjel Valland had no good introduction on the final day with 7th place in the first sail. But since Knut K. Heje came in 5th place, the position after the worst sail was the distance, still that “White Shadow” and “Too Bonita” were the same before the last sail. In that, Torkjel Valland and his crew put in the crucial shock and won – and they secured that victory together and the NM title. “Santa” became number two, while “Too Bonita” was referred to bronze spot with another 5th place in the last race.